Kyle Petty: There will be no 8th title. Remember I've seen this show with my Dad and Dale Inman. My Dad was never really a threat again. Dale won an 8th championship with Terry Labonte. I don't believe William Byron to be the next Terry Labonte. Together they were once "The Team." Time and the sport changes. Dale Jarrett: I think if it's done, it's going to be Jimmie. I think he's got a couple of more opportunities at this. with is still being sharpened and shaped. Jimmie on the other hand, has experience and cunning to make up for any pitfalls. Daniel McFadin: Knaus. His expiration date as a crew chief is further out than Johnson's as a driver but not by much. I don't think Johnson will ever reach eight. Dan Beaver: Perhaps Chad, but probably neither. 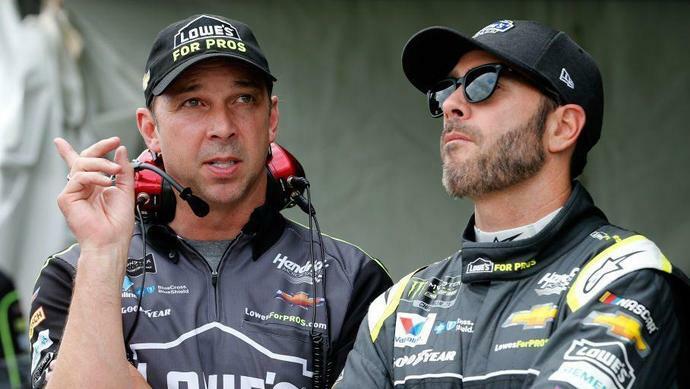 All good things must come to an end and Jimmie Johnson will not earn another. He'll come close a time or two just like Richard Petty after winning his seventh in 1979 but something will continue to keep him from advancing to the final round. Chad's opportunity to win another championship will not come with William Byron, but it is hard to know with whom he'll be paired in the future. Kyle Petty: My Magic 8-Ball says … "None"
Dale Jarrett: I think they have two. I think this weekend at Talladega, obviously, is an opportunity for anybody, but I think Martinsville is probably still their best shot that they have. With Jimmie's experience and the things they've been able to do short-track racing, I think that is their best shot. I think even that's a long shot from what I've seen this year. Parker Kligerman: Martinsville - Need I say more? Nate Ryan: Texas Motor Speedway. The top-five speed at Las Vegas Motor Speedway bodes well for their final race together at the 1.5-mile oval they've conquered seven times. Dustin Long: Martinsville but even that won't be easy. While he won the playoff race there in 2016, Johnson has two top-10 finishes in his last eight starts. Still, this is a track with so much history for Hendrick Motorsports that it would be fitting if it happened there. Dale Jarrett: Chase Elliott. That's the next at Hendrick Motorsports and could be this year. Nate Ryan: Chase Elliott. He'll be among the championship four this season and could capture the 2019 title. Dustin Long: Chase Elliott. It won't be this year but his time is coming. Daniel McFadin: Chase Elliott, just due to his current success and amount of experience in top equipment. Though I wouldn't put it past Alex Bowman to sneak one in before William Byron starts heating up. While manufacturer and team coordination has become a key to success recently on NASCAR's superspeedways, Cup Series star Chase Elliott is not a fan.